Four convicts – including two with murder convictions – have gone missing within the space of a fortnight, it can be revealed. The men are currently listed as being “unlawfully at large” by the Department for Justice (DoJ), with the first one of them having disappeared on January 12, and the last on January 27. Both murder convicts have absconded before; but despite this and the severity of their offences, no media appeals appear to have been issued to try and trace them. One of the killers, Samuel McKinley, had gone on the loose as recently as 2014. The other killer being sought is Thomas Lawrence McCabe. The remaining two men the authorities want to trace have convictions for lesser crimes, mainly involving theft. 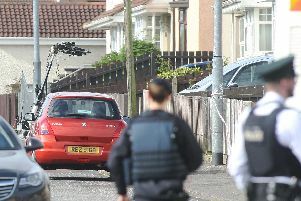 DUP MP Gavin Robinson, the party’s justice spokesman, said there appeared to be a “troubling recurrence” of such cases. In response to queries, the PSNI last night said “an active wanted person investigation is under way”, but did not explain why it had not publicised the hunt for the convicts. The first of the recent spate of disappearances was on January 12, when Wesley Brennan, 31, went missing. He had been imprisoned in Maghaberry. His offences were breaches of community orders, fraud, thefts, and driving whilst disqualified. He had been permitted home leave, but the exact circumstances of his disappearance are unclear (as they are for all of the men concerned). Then on January 19, two convicts who had been held at Maghaberry became listed as being unlawfully at large on the same day. One was Samuel McKinley, 56 – who has a conviction for murder, plus being unlawfully at large, resisting police, taking a vehicle without authority, and theft. Under his “release type”, the DoJ states: “licence revoked”. McKinley (who sports a tattoo of a gun on his leg and an Ulster flag on his right arm) stabbed a friend to death in 1996 in southern England. In December 2014 he absconded and was not recaptured until March 2015. Also on January 19, fellow convicted murderer Thomas Lawrence McCabe, 53, also became listed as being at large. Under “release type”, the DoJ likewise states for McCabe: “licence revoked”. McCabe (who has a tattoo of a tricolour on his left arm) was an alcoholic who was originally from Northern Ireland but later moved to England, according to the text of a judgment from the European Court of Human Rights. It said the background to his case is that he pleaded guilty in 1990 to murdering an 18-year-old relative of his girlfriend in a fit of drunken jealousy, and got a life sentence. The judgment states he had been taking part in a pre-release scheme around the turn of the millennium, but disappeared a number of times whilst on it. It quotes from an assesment by a ‘Lifer Management Unit’, which said by summer 2002 he had been unlawfully at large four times. The DoJ has said it cannot comment on why convicts’ licences were revoked. The last to go missing in this latest spate is Sean Tate, 41, a prisoner at Magilligan, and who became listed as unlawfully at large on January 27. His offences are aggravated vehicle taking, aggravated burglary, stealing, robbery, possessing an offensive weapon in public, and breach of a custody probation order. He had been granted compassionate temporary release. The DoJ and police were asked about the men, and why there was no public call for helping to find them. The DoJ said when a prisoner is unlawfully at large the Prison Service informs the PSNI, and the information is posted on the DoJ website. It also said before prisoners get leave, they are “robustly risk assessed”, and that abuse of such leave is “very small”. The PSNI said it takes “seriously the public’s concern about prisoners being unlawfully at large”, adding it is “undoubted” that information from the public can be useful, but did not address why the cases had not been publicised. Mr Robinson said: “There’s a troubling recurrence of cases of this nature.